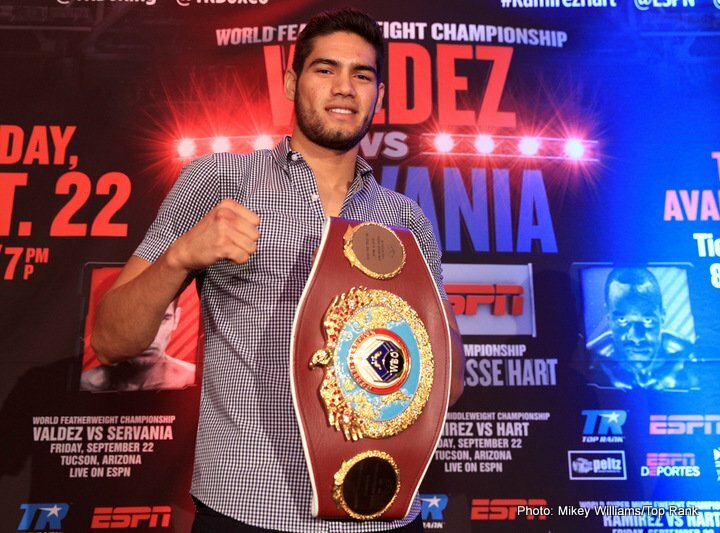 WBO super middleweight champion Gilberto “Zurdo” Ramirez (37-0, 25 KOs) used his big size advantage over the smaller, weaker little known fighter Habib Ahmed (22-1, 17 KOs) in stopping him in the 6th round on on Saturday night in a dreadful mismatch on ESPN at the American Bank Center in Corpus Christi, Texas. This was not a good fight. If the idea was to make Ramirez look good in matching him against a mediocre opponent, I think it was a fail. Ahmed ran around the ring all night long and looked like a terrible fighter. The match-makers for Ramirez have to do better than this in the future if they want him to become a star. You don’t make a star on the cheap by sticking them in with guys with little talent, size and a badly inflated record and ranking. Ahmedi didn’t fight like a fighter that deserved a #4 ranking with the World Boxing Organization. He fought more like a bottom 50 contender. The smaller 5’9″ Ahmed was running from Ramirez for most of the fight. In the 6th, Ramirez caught up with Ahmed and hurt him with some head and body shots againt the ropes. The referee Lawrence Cole then stepped in and halted the fight once it was clear that Ahmed was hurt. The fight was stopped at 2:31 of round 6. After the fight, Ramirez said he wants to fight the winner of the World Boxing super Series super middleweight tournament. Ramirez says his promoter Bob Arum told him he gets to face the winner of the tournament. We’ll have to see if that actually happens. Ramirez has talked a lot of how Arum is supposed to be getting him a fight against middleweight champion Gennady Golovkin. Ramirez has been talking about the Golovkin fight for 2 years, and it’s now happened. Ramirez looked like a full-fledged light heavyweight in size tonight after he rehyrated. It’s hard to believe Ramirez can still make 168, because he looks huge for the weight class. He barely made weight last Friday, and it appears his days are numbered in the weight class. Once Ramirez moves up to 175, he’s going to have a very hard time trying to deal with the guys his own size like Sergey Kovalev, Artur Beterbiev, Adonis Stevenson, Badou Jack and Dmitry Bivol. Ramirez will likely resist moving up to 175 for as long as possible, because once he’s mixing it with those guys, he’s going to have time. Next boxing news: Joe Joyce could face Dereck Chisora later this year; is it too soon for the 1-0 hope?